MWRA's NPDES discharge permit requires reports on several measures of environmental quality and system maintenance. This is intended to control water pollution and ensure compliance with the federal Clean Water Act. 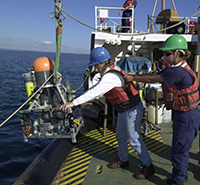 MWRA monitors the water quality of Boston Harbor, Massachusetts Bay, and Cape Cod Bay, measuring nutrients, pathogens, metals, organics, solids, pH, oil and grease, and toxicity. Press Release: How Clean Is Boston Harbor?